Girls are taught a lot of stuff growing up. If a guy punches you he likes you. Never try to trim your own bands and someday you will meet a wonderful guy and get your very own happy ending. Every movie we see, every story we’re told implores us to wait for it, the third act twist, the unexpected declaration of love, the exception to the rule. But sometimes we’re so focused on finding our happy ending we don’t learn how to read the signs. How to tell from the ones who want us and the ones who don’t, the ones who will stay and the ones who will leave. And maybe a happy ending doesn’t include a guy, maybe… it’s you, on your own, picking up the pieces and starting over, freeing yourself up for something better in the future. 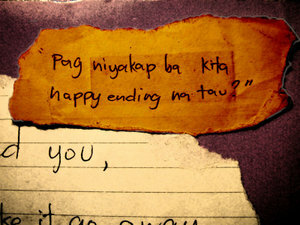 Maybe the happy ending is… just… moving on. My silence is my self defense. But if my silence made you leave, then that would be my worst mistake. it’s okay … to choose … her. If he wants to find you, he will. "If you can find him, then he can find you. If he wants to find you, he will." I saw him. He was a little surprised to see me. I made it a point to talk to him alone. I can still sense the love. I knew he wanted to kiss me. I was trying to win him back. I kissed him. He kissed me back. Heaven. Then something stopped him and he quickly ran away without saying a word. into my dreams he finds his way. “lav pa ba kita?” — NO WAY! para gising ko ay maganda. :haha: my gulay! poetic!!! kulit ng lahi! as i’ve said kanya-kanyang trip yan…walang pakialamanan! walang magawa, and yet ang dami kong dapat gawin! …because i think i love(?) him still. **: u think o u know? ui: ewan ko sa yo!